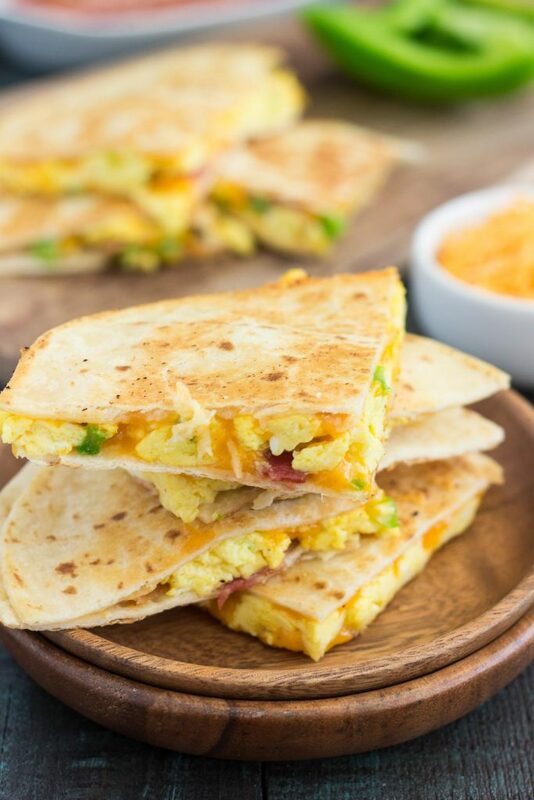 These Easy Breakfast Quesadillas are filled with fluffy, scrambled eggs, green peppers, bacon and cheddar cheeses, all enveloped between two crispy tortilla shells. It’s an easy meal that’s perfect for busy mornings! If you were stranded on a desert island and could only have one meal, which would it be? Breakfast, lunch, or dinner? For me, it would be a toss-up between pizza and breakfast. Pizza is my favorite non-breakfast food (unless you eat it for breakfast, like I do sometimes, then I guess it’s considered breakfast, right? ), but breakfast is my favorite meal of the day. So, if I were stranded on a desert island, I would probably choose pizza for breakfast. Makes sense, right? Truth be told, I’ve been wanting to make these Breakfast Quesadillas for a long time. I’ve had this idea for months, and while this is not a new and creative recipe, it’s one that I truly love. And since I’m all about sharing my favorite recipes, I knew you would enjoy this, too. Eggs, bacon, and cheese all wrapped up in a convenient, grab ‘n go breakfast for busy mornings? Perfection, right there! I’m always looking for ways to make my breakfasts just a little bit easier and a whole lot tastier, so these quesadillas definitely did the trick. 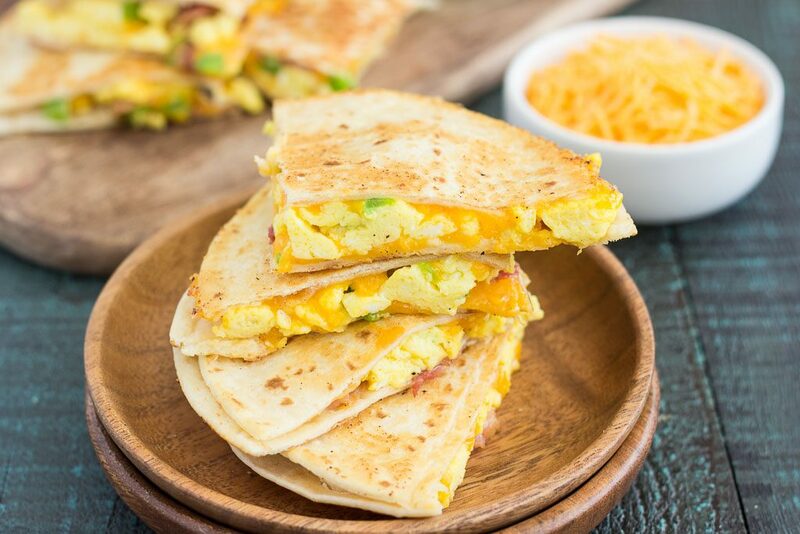 And like most of my recipes, these tasty Breakfast Quesadillas are a breeze to whip up! From start to finish, you can have this prepped, cooked and ready to be devoured in less than 20 minutes. How about that for a weekday breakfast or weeknight dinner? I also love these quesadillas because they’re so easy to customize depending on your tastes. Since the hubster and I love scrambled eggs, bacon, green peppers, and cheese, those were my go-to ingredients for this dish. But, if you prefer sausage, add it in! Hate green peppers? Leave those out. Like feta? Throw it in! The possibilities are endless. This Breakfast Quesadillas recipe are oozing with flavor and are perfect for keeping you full all morning long. 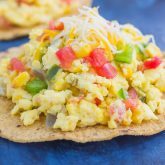 The fluffy eggs, crisp bacon, green peppers, and melty cheese create an irresistible combo when wrapped in a tortilla shell. And if you love breakfast for dinner (or brinner) like I do, then you’ll adore this easy dish. You might even say this would the one meal that you would ask for if stranded on a desert island! Looking for more breakfast ideas? I’ve got you covered! 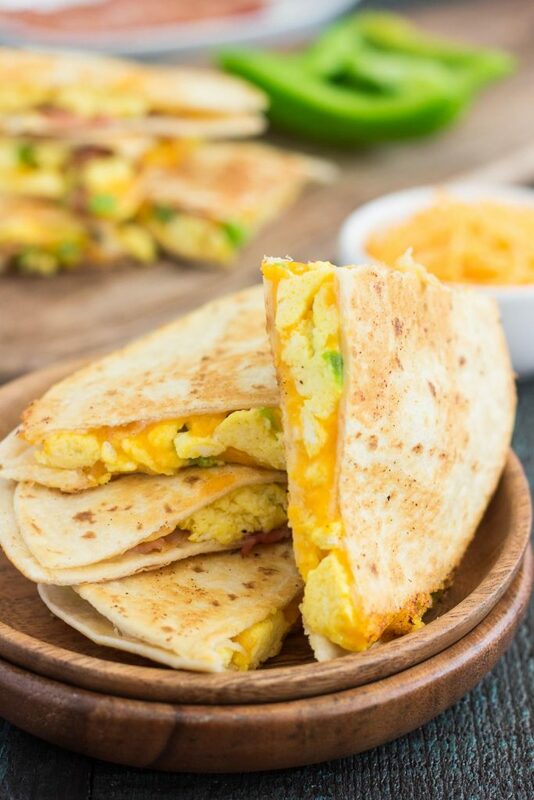 These Easy Breakfast Quesadillas are filled with fluffy, scrambled eggs, green peppers, bacon and cheddar cheeses, all enveloped between two crispy tortilla shells. It's an easy meal that's perfect for busy mornings! In a medium bowl, whisk eggs, milk, salt and pepper. Add green peppers and stir to combine (see note below). Set aside. In a large skillet, melt 2 tablespoons butter over medium heat. Add egg mixture and cook until no longer runny, stirring often. Remove eggs to separate plate. In the same skillet (wipe, if needed), melt 2 tablespoons butter over medium heat. Place one tortilla shell in middle of pan. Top with 1/4 cup cheese, leaving a 1/2 inch border around tortilla. Spread eggs in an even layer on top of cheese, followed by bacon and a sprinkling of more cheese, if desired. Place second tortilla shell on top of egg mixture and lightly press down. Heat for 2-3 minutes on both sides, or until shell is slightly golden and cheese is melted. Repeat with remaining tortilla shells. I chose not to sauté the green peppers before adding to the eggs, which keeps them slightly crunchy. If you prefer softened green peppers, sauté them in a tablespoon of unsalted butter/oil until softened before adding to eggs. Yes! Bacon all way! Thanks for the kind words, Kate! So glad you and your family liked this, Aidan! Thanks for stopping by and letting me know how it turned out! If I were stranded on a desert island, I'd want the chocolate with me. But for breakfast, I'd want this. I really love quesadillas of all kinds, and breakfast ones are so filling and delicious. All that cheesy goodness! Chocolate would definitely be on my list, too! Thanks for the quesadilla love, Mir! Breakfast is definitely my favourite meal too. I have never understood how people can miss breakfast - I love it! I am totally on board with Mexican for breakfast too. Yes! Breakfast is the best, and I love it for dinner, too! Thanks, Dannii! These look like my perfect breakfast! Such a great way to start the day! What an awesome idea, Gayle! I love quesadillas, but never had in breakfast form and who doesn't like breakfast? I think if I were stranded on an island, it would have to be breakfast. Oh, and a breakfast pizza? Yes, please! I'll take that too :) Now your just making me hungry, lol :D. Pinning and making real soon. Thank you for the sweet comment and pin, Dawn! This was my first time making breakfast quesadillas, but definitely not the last! You know how I love my breakfast foods! I love these quesadillas! Wish I had one in front of me right now! Breakfast is the best! Thanks, Jessica! This is so smart! I've made lots of quesadillas in my time - I even did a quesadilla bar for a party back when I catered - but I can honestly say I've never made a breakfast quesadilla! So smart. Thanks for the kind words and for stopping by, Mimi! This would make such a delicious breakfast, especially on a lazy weekend morning :) Looks delicious! I'm with you...breakfast, all the way! I wonder how many people would choose lunch as the meal of choice? hahhhaa - Anyway - this breakfast looks amazing and would suit me just fine if stranded on a desert island. Delish!! Haha I have a feeling lunch would be the least favorite meal! Thanks for the kind words, Annie! Pizza for breakfast sounds great, but these quesadillas look so delicious! Never made them for breakfast, but will definitely try them! Pinning! Thank you, Mira! They're such a fun and delicious option for breakfast! Who cares if it's original or not?! It's delicious! We LOVE brinner and breakfast and brunch, so these would be a hit here any time of day! Brinner is my favorite, too! Thanks, Ashley! It can't say if I'd want a particular meal, but I would want access to all the fruit. Would that count as breakfast? These quesadillas look amazing, Gayle. And while I probably wouldn't eat them for breakfast, I would definitely chow down on something like this for lunch!! Fruit definitely counts as breakfast! Thanks, Jen! Gayle, breakfast quesadillas are always a big hit at my house! These look amazing! love!! Oh my...this is my kind of quesadilla! 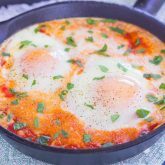 I love the breakfast spin on one of our favorite dinners -- I bet it's amazing! Easy meal are the best, right? :) Thanks, Kelly! I've never made breakfast quesadillas and I have no idea why! These would be a huge hit in my house and I'm so excited to whip these up! These look delicious, Gayle! Thanks for the quesadilla love, Marcie! If I was stranded on an island I would most definitely choose breakfast. But I'm loving your idea of choosing pizza for breakfast! Sneaky! ;) There was a place back in FL that had the best breakfast quesadillas and I would order them whenever we went there for brunch. Since moving to NC I haven't had a breakfast quesadilla so I am loving that you posted this!! These sound absolutely perfect, Gayle! Packed with breakfast deliciousness! Totally making these over the weekend!! Pinned! Cheers, friend! Haha pizza for breakfast does sound good, right? :) Thanks for the kind words, Cheyanne! I haven't had a breakfast quesadilla at a restaurant, but the one you had in Florida sound delicious! Thanks for the quesadilla love, Medha! I love making breakfast quesadillas on the weekend!! They really are just the best! These sound delicious- you're making me wish we were having breakfast for dinner tonight! Thanks, Ashley! This was my first time making breakfast ones, and I'm hooked! If I were stranded on a desert island I'd want endless bowls of popcorn and pans of macaroni and cheese. Although, I'm sure none of that would actually be possible on a desert island, but that's what I would want ;) These breakfast quesadillas look delicious! I always do scrambled eggs and pepper jack, but now I'm totally adding bacon and peppers to amp them up! I like your idea of endless bowls of popcorn! :) Thanks for the quesadilla love, Keri! I love breakfast quesadillas and would love these for dinner too! 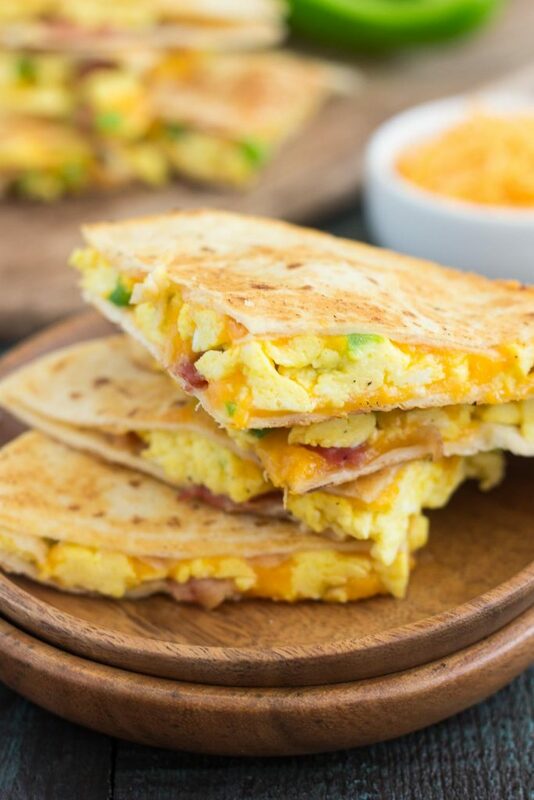 On the weekends, I will often make breakfast sandwiches to reheat for a few days during the week and think these quesadillas would work really well too. Thanks, Ashley! 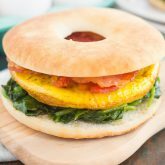 Breakfast sandwiches sound delicious too! One of my favorite breakfast places in San Diego makes the BEST breakfast quesadillas, but I've never tried making them myself! These look so delicious, Gayle. Such a fun breakfast! such a filling and flavorful breakfast! love it! I love breakfast quesadillas too and even today that's what we had! They are easy and love how filling they are!! These look yumm girl! #BestIdeaEver These look at really yummy. One of my favorite breakfast quesadillas the s grilled chopped tomato and onion, pepper jack cheese topped with sliced avocado. I really want to try this recipe. Thank you for the kind words, Patricia! Your favorite quesadilla sounds delicious! I love the addition of tomatoes and avocado. I hope you love this version if you try it! What would be the quantities for 1 serving only, or is it any good reheated after stored in the fridge, anyone tried to store it? Hi Robert! I've never made this for just one before, but I would roughly use two eggs, a few tablespoons of milk, and adjust the rest of the ingredients. I've kept this in the fridge for up to two days before and it's reheated wonderfully. Hope you love it if you try it! These are a great idea! Who would've thought! I am making them for the church band tomorrow. Yum yum! Thank you, Ann! I hope you love these quesadillas. Thanks so much for stopping by! I hope you love these quesadillas! Thanks for stopping by! 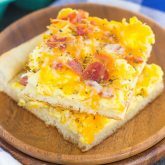 Love the updated photos for this simple and delicious breakfast option -- perfect for my quesadilla-loving kiddos!